Reunited and it feels so good. The climax of this episode has been a long time coming. The assembly of the entirety of Team Machine is very satisfying to see after such a long separation. Some elements of this reunion are more satisfying than others but overall, it’s a welcome sight to behold. This isn’t the only aspect of “Sutto Voce” that feels nostalgic. 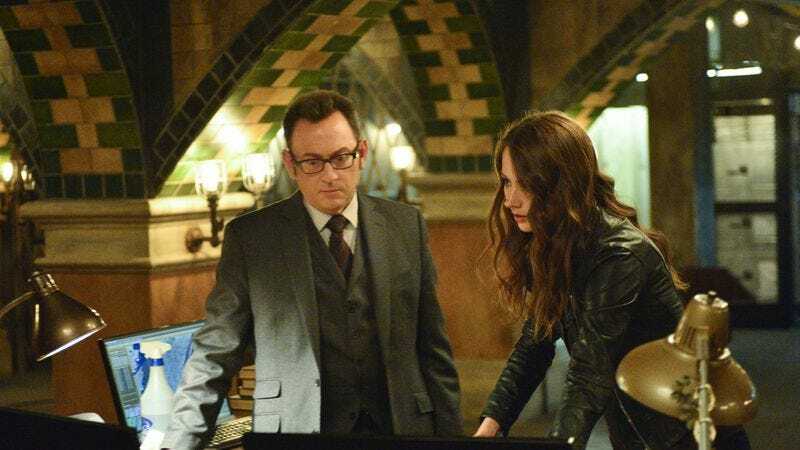 In many ways, this episode is a reexamination of Person Of Interest’s central premise. The show concerns victims and perpetrators, and the difficulty of distinguishing between the two in this world—even when evaluating oneself. Trust is an important asset that’s difficult to come by when allegiances aren’t always clear. The big twist of the episode reveals that the supposed victim is actually the perpetrator. 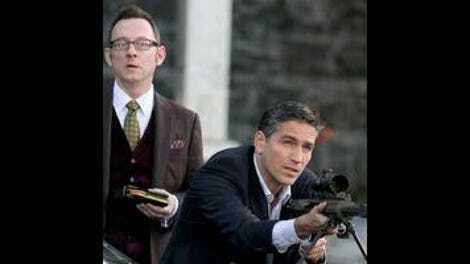 This isn’t a new type of reveal that Person Of Interest invented, but it actually resonates in this context because of the episode’s thematic connections to the show’s premise. The supposed victim in question is Terry Easton, a man who claims he’s breaking and entering into an investment firm because his wife is being threatened by an anonymous kidnapper. Finch recognizes the voice and takes the case. Meanwhile, Fusco is at the precinct questioning a cabbie accused of holding an unliscensed firearm. Thanks to Fusco’s detective work, Amir Sadeek is taken into custody for the murders of four people. With a series of traps and bomb scares, the kidnapper lures the police away from the precinct in order to corner his real target—Sadeek, a former employee. These two seemingly disconnected cases are linked, and they also link two pairs associated with Team Machine. Elias volunteers to accompany Finch on his pursuit of the kidnapper, justifying his kindness by saying that he owes Finch his life. While Elias’ services are appreciated, his true intentions are always in question given his history. Throughout the episode, Elias’ potential investment in this situation is always a possibility, but he remains loyal to Team Machine in the end. Elias has always based his allegiances on self-interest, but those days may finally be over. Two of his criminal friends have been killed, and he seems to recognize a truer friend in Finch than anyone he’s associated with before. He helps Finch track down Easton—then blows Easton up; for someone like Elias, this is progress. Another dramatically-interesting couple pursuing this case is Reese and Fusco. These former partners and teammates find themselves working side by side together once again, and quickly fall back into the old routine. At one point, they discover that a police officer is actually working on behalf of the kidnapper under duress, and that reveal reinforces the notion that in this world, survival requires questioning everything. Still, Fusco and Reese are drawn together again because despite their differences, they do trust one another. Fusco knows his teammates are keeping secrets from him, but he also knows that these people have his best interests—and the world’s best interests—at heart. The B-plot involves a more emotionally-charged pairing. Shaw finally finds Root—in the real world this time—but their bliss is short-lived. Shaw knows how this scenario will end. Like the Machine, she has endured thousands of simulations calculating the outcome of this very situation and the results are never good. Shaw warns Root to stay away because she is no longer in control. She has been programmed to attack her teammates and cannot be trusted. In a fairly cheesy sequence compared to the elegance of their final confrontation in “6,741,” they demonstrate their willingness to risk their lives for one another. Like usual, Root gets her way and Shaw is brought back into the fold. Root has always expressed undying loyalty to her favorites, be they human or Machine. Now that she’s found Shaw once again, she can’t let her go, whether not this is still the same woman she used to trust. This reunion of Team Machine for the first time in ages is earned. Still, the hard-won journey is more satisfying for some characters than others. The best pairings this season have been Root and Finch as well as Root and Shaw. Some of the other character dynamics have fallen by the wayside, an absence that’s also felt in this episode when plotting and action sometimes takes precedence over time that could be better spent exploring the nuances of these particular pairings. Shaw’s rejoining the team is much more resonant than Fusco’s return, which makes the climax of the episode feel a bit uneven. It makes sense that one story as dramatic as Shaw’s might take priority, but Fusco’s could have been more developed. A comparatively short absence because of the same basic concerns he’s had since the beginning of the show isn’t nearly as powerful as Shaw’s plight, so his arc suffers with the inevitable comparison. Fusco didn’t need more screentime necessarily; the scenes he had could’ve been executed more creatively. Nevertheless, Reese’s decision to finally disclose the true enemy that Team Machine has been up against—and the origins of their team name, hopefully—is powerful. The increasingly easily corrupted police force has been a slow burner of an arc, but it really pays off here. At this point, Fusco needs to be told about the Machine and Samaritan for his own safety, and the development feels organic. Now that the team is assembled, they may be ready to face the enemy side by side. Fusco is probably thrilled.